The Bahamas undoubtedly offers some of the best shark diving options available in the world! 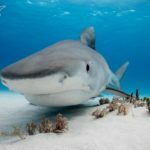 Tiger Beach has been a long time favorite among shark diving enthusiasts with it’s abundance of large sharks including Tiger Sharks, Reef Sharks, and Lemon Sharks. 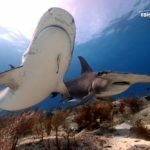 Bimini has emerged as a hotspot for reliable encounters with the elusive Great Hammerhead Shark, as well as regularly seen Bull Sharks and Nurse Sharks. But there is another hidden gem in shark diving lying in the central Bahamas. On the eastern edge of Exuma Sound, the deep water is a favorite hang out of the endangered Oceanic Whitetip Shark, an extremely photogenic pelagic species. When do you run Oceanic Whitetip Shark Diving day trips? 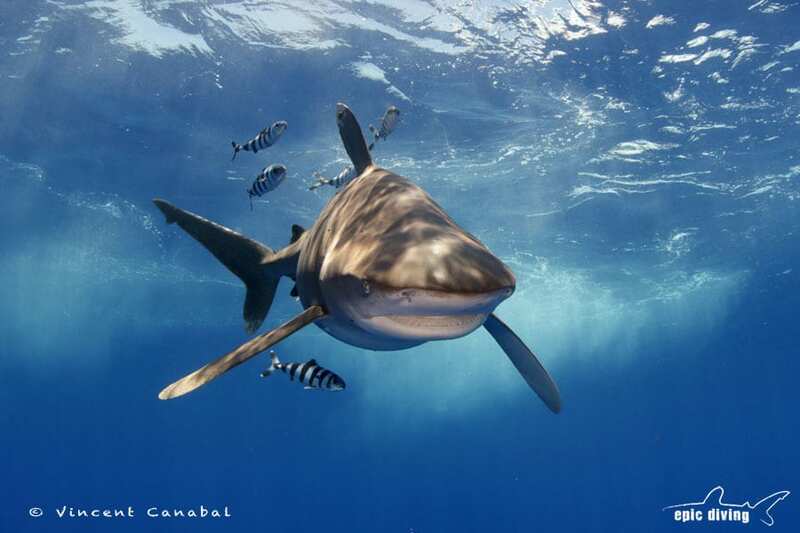 The spring season is the right time of year to seek out encounters with the oceanic whitetip sharks. They are migratory but return each year in large numbers during the spring months. Their migration is believed to be related to mating or gestation as most of the oceanic whitetip sharks we see are female, and many of them are pregnant. What are day trips to dive with the Oceanic Whitetip Sharks like? 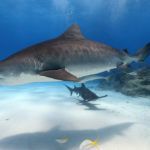 A typical day trip to dive with the oceanic whitetip sharks involves an early start to grab a bite to eat before boarding the boat for the ride out to the shark grounds – click here to visit Intrepid Powerboats used for the trip. MV Thresher is fully equipped for comfort and safety to enjoy the whole day out on the water. In addition to all the seating space on the dive deck and up on the flybridge, there’s also a fully enclosed cabin to get out of the elements on some of those not so inviting winter mornings. Both the flybridge and inside cabin have stereo systems with bluetooth connectivity to enjoy your favorite playlist. The oceanic whitetips stay around the boat all day long, allowing for lengthy in water encounters. We will do a combination of SCUBA diving and snorkeling/freediving to best take advantage of the opportunity and maximize our water time. The encounters are different on SCUBA vs snorkel, and each have their pros and cons. SCUBA diving with oceanic whitetips is effortless drift diving where proper buoyancy is crucial and you’ll be able to sit back, relax, and enjoy the show. While snorkeling with oceanic whitetip sharks, you’ll be able to take advantage of the awesome surface light and close up photo ops. Read more here to make the right choice. How many days should you swim with Oceanic Whitetip Sharks? We recommend no less than three days planned to dive with the oceanic whitetip sharks. Even though it’s the spring season when weather is usually getting calmer, there may still be occasional squalls of heavy winds and high seas, preventing us from making it out for diving or snorkeling with the oceanic whitetip sharks. The dive area is located in deep ocean water and can seas can build quickly. We offer standard packages with either 3 or 5 days of diving planned. We know it can be really disappointing to lose a day of diving and we strongly recommend travelers secure some form of travel insurance specific to diving, such as the kind offered by DAN or DiveAssure. What can we expect to see in a day trip to dive with Oceanic Whitetip Sharks? We have been diving with oceanic whitetip sharks for the past 8 years and the encounters have only gotten better over time. We have had days with up to 15 of the pelagic sharks spending the whole day with the dive group! The exciting part is that aside from the oceanic whitetips, you never know what else might show up while drifting out in the crystal clear deep blue. We have had regular encounters with Silky Sharks, Dusky Sharks and Reef Sharks, as well as the occasional Blue Shark, Mako Shark and even Great hammerhead and Tiger Sharks! And sharks aren’t the only marine animals bringing in the heart pounding excitement. Huge schools of tuna, mahi mahi (aka dorado or dolphin fish), and even Blue Marlin and White Marlin! It really is a special place worth checking off your list of shark diving hotspots! How do I arrange day trips to dive with oceanic whitetip sharks? 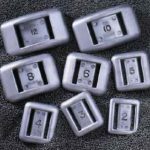 Having such a short season, we generally book up well in advance, so it’s best to contact us early. Our calendar is set and boat reserved throughout the season so we don’t have space for your typical open bookings. Contact us for dates and availability. I would love to dive with the Oceanics someday!